Yesterday Rex Dieter announced the landing of KDE 4.2.85 in kde-redhat/unstable for Fedora 11 (Fedora 10 coming soon). Since I like to live on the bleeding edge, I decided to give it a try. Installing it was fairly easy. You just have to make sure that you’ve got the kde-redhat repositories installed and that the unstable repository is enabled. A simple yum update will do the rest. Since I just installed it, I haven’t had the time to thoroughly test it. But, so far so good. 🙂 I haven’t seen any major problems yet. done very little testing other than “woo it builds, SHIP IT!”. Enjoy. I had a day off due to the Easter holidays. That gave me some space to play with kdesvn-build to have a go at KDE 4.3 (while compiling, I was outside having a beer). Surprisingly after some rebuilds because of missing dependencies, I managed to have it almost fully, and more important, successfully compiled for F10. I’ll post a KDE 4.3 screenshot tour later on. 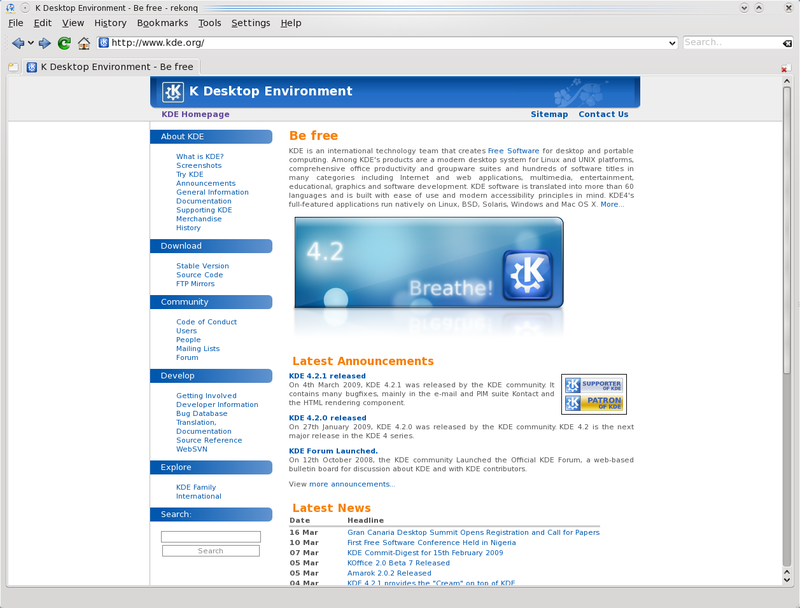 In advance to that, I’m impressed with the work that has been done on KDE 4.3. To me, it feels just as fast (or even faster than KDE 4.2.2) and I haven’t had or seen any major issues so far. Amarok 2.1 beta 1 has been released Abhishek Rane has posted a screenshot tour with instructions on how to get it up and running for F10 (and F9 soon). You’ll find it here: http://www.abhishekrane.com/2009/04/11/amarok-21-beta-1-screenshot-tour/. Jesse Keating announced a Fedora 11 Snapshot release. The information got posted to the fedora-announce list. You find a copy here: https://www.redhat.com/archives/fedora-announce-list/2009-April/msg00004.html. but that is not really encouraged because you might miss out on other important updates related to KDE. Also note that the update pulls in Qt 4.5 which has been used to build KDE 4.2.2 against. There’s a very nice mailing list regarding Fedora and KDE which you’ll find here: https://admin.fedoraproject.org/mailman/listinfo/fedora-kde. There’s a lot going on there regarding these kind of updates and Fedora/KDE updates in general which you might find interesting. Usually I’m not fond of posting blog entry’s so close to each other, although nicu has kindly pointed out to me that there is an official Fedora countdown counter (https://fedoraproject.org/en/counter). I didn’t realize it existed until it got pointed out (well I knew about it, although my enthusiasm beat me to it). He also pointed out some other, rather important, things too. That counter seems to be a bit more advanced than mine. It’s multilingual and follows a central timestamp (convenient when a release date changes). Mine didn’t do both. Also the whole temple theme is going to be changed into a lion one, post-beta. Therefor I had to make some changes to my script. I now use a central date too (located at my server though) and I whipped up a second version of the script using a lion theme. I also made some rounded corners on this image which worked out pretty well. There still are many other things I could change (timezones, custom background images, multilingual etc). I’ll fiddle around with it for a while and will post any updates in the comments for this post. Installation is quite simple, you download the package from the author’s (adjam) website (http://rekonq.sourceforge.net/) and follow the rules in the INSTALL file. To improve my packaging skills I decided to wrap it up in a shiney RPM which I will share below. I tested it on Fedora 10 with Qt 4.5 and it seemed to work fine. A download link can be found here: rekonq 0.0.4 (rpm, srpm and debuginfo). PS. I recently finished the procedure to become a Fedora Contributor (Package Maintainer). I think this will be a nice project to get started with. I’ll keep you updated on this one. 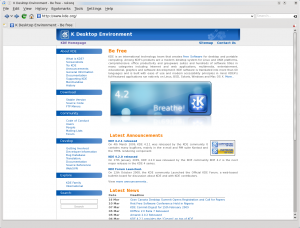 Yay, KDE 4.2.1 has been released and already landed in the kde-redhat / testing repository’s. Thanks people of Fedora KDE SIG (Fedora KDE Special Interest Group)! Read the official announcement here: KDE 4.2.1 Release Announcement. And check the changelog here: KDE 4.2.1 Changelog. Note to x86_64 users: You may have to enable both x86_64 and i386 repos. ought to fetch and install the packages for you. on your system as well. Keep in mind that these are 3th party repository’s and are not officially supported by RedHat or the Fedora Project.